Combine the first 5 ingredients (almonds, oats, flour, cinnamon & salt) in a large mixing bowl, blending well. Combine oil and syrup. Then add to flour mixture, stirring well. Roll small amounts of dough in the palms of your hands into little balls and place on an ungreased cookie sheet. 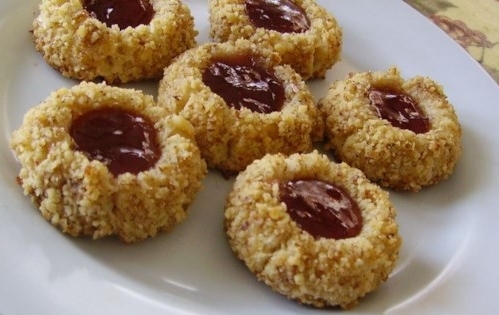 With your fingers make a small indentation in the center of each cookies and add about 1/2 teaspoon of raspberry jam. Bake at 350 degrees for 15 minutes, until lightly browned. More great recipes like this one may be found in Gordon & Laura's book Cooking for Life.